WTI is trading near $65.00 during the early Asian session. The energy benchmark previously stretched its north-run to a fresh five-month high amid geopolitical tensions in Libya and Iran. Libyan National Army loyal to General Khalifa Haftar was aggressive in its march to acquire the capital Tripoli in a bid to seize power. The troop was asked to stop by the US Secretary of State Mike Pompeo. On the other hand, the US President Donald Trump declared Iran's revolutionary guard as a terrorist organization and is aiming further damages to the OPEC member after it couldn’t please the US on nuclear terms during 2018. Traders may now additionally to this focus on the API data and the updates from the trade negotiation. 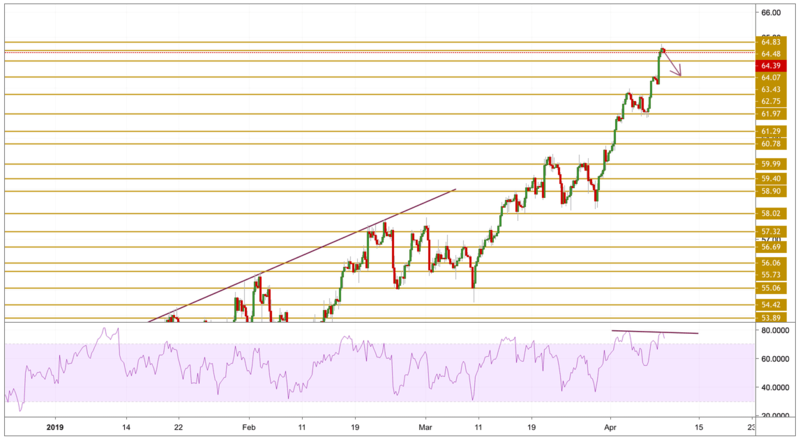 Crude oil prices surged back up and this time printed again some new highs at $64.46 per barrel after gaining some momentum. However, with now the price being held at the top, we can notice a significant divergence between the momentum and the price in the overbought zone, pointing to a potential correction for the price to the downside. We will be focusing on the near support levels, especially the $63.43 support level.